Centric Cleaning is Lexington and the surrounding areas go to source for residential and commercial tile and grout cleaning. We have the greatest tile cleaning machine on the market. All of our tile and grout cleaning services are backed by a 100% satisfaction guarantee. 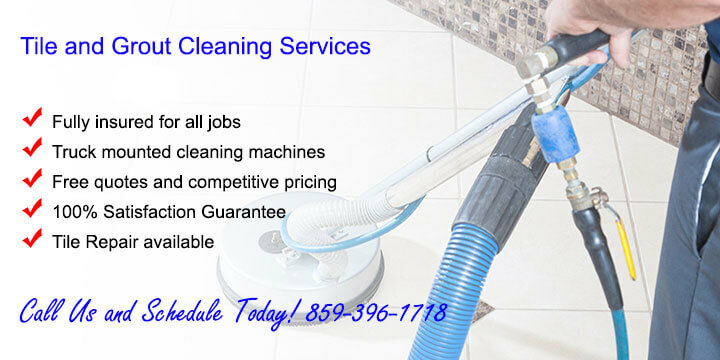 We also provide tile and grout cleaning services in the surrounding cites of Winchester, Georgetown, Richmond, Frankfort, and Nicholasville KY. If you’re tile and grout lacks that sparkling clean look it used to have. We can restore it to a fresh new condition for you. There are several different types of tile cleaning methods we use, and types of tile that we encounter on an ongoing basis. Knowing which is which is critical in how they’re cleaned. Sometimes referred to as quarry tile. Ceramic tiles are composed of a High temperature baked clay, mineral, and water mix. Once they’re oven glazed they’re treated with a glass coating and baked again. Not only are they stain and scratch resistant, they’re very hard. For tile floor cleaning we recommend cleaning them once a week by sweeping or vacuuming the dirt from the floor, followed with a damp sponge or mop and mild cleaning solutions. Porcelain tile is Ceramic tile that’s more dense and baked at a higher temperature. This in turn makes it less porous, harder, and in turn more durable. We recommend the same cleaning procedure used for Ceramic tile. If more aggressive cleaning is needed we may use a floor cleaning machine equipped with a mildly abrasive pad or stiff bristle brush. For tile shower cleaning we use the same procedure, but do any scrubbing by hand. For tile back splash cleaning we may use a mild solvent for removing any oils or grease build up. Cleaning marble floors is much more sensitive than other types of tile. Any cleaners used have to be PH neutral or there’s a risk in damaging the floor. We recommend to have your marble floors professionally cleaned so that there’s no risk of damage. While marble is a very hard stone, it’s also porous and easier to stain and scratch. Granite is a very delicate type of tile and granite tile cleaning should be done with care, after all it’s very expensive. All spills on your granite should be wiped up immediately. Also we recommend having your granite sealed annually. We recommend a daily light cleaning for granite to keep it looking good. A thorough cleaning should be done periodically with an approved granite cleaner. Never use an abrasive, bleach, or or detergent based cleaner on granite tile. Any of these risk discoloring the granite. Beyond the daily maintenance cleaning, we recommend for home and business owners to have their granite tiles professionally cleaned. Quarry tile is made of clay and is purposely UN-glazed so that it maintains a rustic look. It makes a great commercial tile and is found mostly in restaurants, kitchens, and bathrooms where heavier traffic is common. Cleaning quarry tile is a straight forward process and involves vacuuming or sweeping up any excess dirt. This is followed by a specially formulated cleaning solution applied with a wet mop. Ground in dirt may call for a deep cleaning. We use our floor scrubbing machines and a mildly abrasive pad. Afterwards the floor may need to be resealed. For badly soiled floors we recommend hiring a professional floor cleaning company. Our tile and grout cleaning guarantee is simple and straight forward. Because our focus is on 100% customer satisfaction if at any time you’re not satisfied with the cleanliness of our completed project we will totally re-clean it or refund your money. We’re committed to being the best cleaning business in all of Central KY, and your complete satisfaction is very important to us. It’s fairly common to find mold, mildew, grease and allergens on a tile and grout surface. The primary reason for this is where tile and grout are normally found, which is usually in a bathroom, kitchen or a high traffic area. Bathrooms and kitchens are very “high moisture areas” proving mold and mildew can readily find a home in such an environment. Having your tile and grout cleaned and sealed professionally can prevent this buildup, which in turn will result in a healthier and more visually appealing environment. Only a professional cleaning service can remove these types of grime. Call us today and we can get your tile and grout cleaning project started for you. We’ll have you on your way to making your home or business healthier for your family or business patrons and employees. The molds and mildews that are most commonly found on during tile and grout cleaning projects are unhealthy to humans and animals alike. They can and do aggravate asthma and allergies. Typical symptoms include sneezing, coughing, wheezing, water eyes and respiratory congestion. Call us today and we can get that tile and grout cleaning project started for you. We’ll have you on your way to making your home or business healthier and looking great for your family or business patrons and employees. Getting a Tile and Grout Cleaning Estimate is Easy! Just pick up the phone and call us at 859-396-1718 or use our CONTACT US FORM. We’re friendly and approachable and yes! We provide free estimates for our tile and grout cleaning services. Call today!